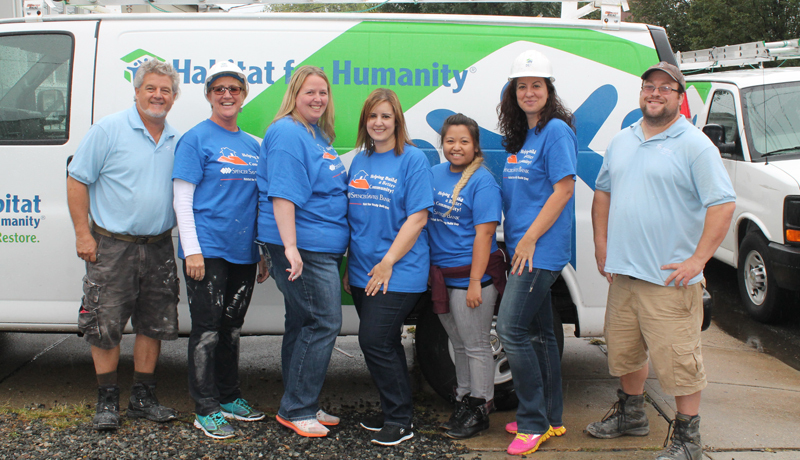 Spencer Savings Bank, a community bank headquartered in Elmwood Park, partnered with Habitat for Humanity of Bergen County for the second year in a row on October 2, 2015 for a build day in Hackensack. Spencer sent a team of 5 employees to the job site and also made a $1,000 donation to the organization. The day’s events, part of Habitat for Humanity’s Sandy Restoration Program, included spackling, as well as installing doors and trim. The work the Spencer team did will allow the next team coming in to continue the finishing work of priming and painting. The Sandy Restoration Program facilitates short- and long-term housing solutions and other services for low-income families affected by the storm. The Bergen County initiative was launched in January of 2013 with an emphasis on Little Ferry and the surrounding area. In addition to building projects, affected residents are offered recovery support through the Sandy Recovery Information Center, located at the Moonachie First Presbyterian Church. The other repair work occurring at this Hackensack residence included removing and replacing the roof framing and roofing over the rear entry; insulating, installing drywall, spackling and painting the damaged basement; and fixing the plumbing leaks in the basement and providing hookup to a new washer and dryer. Spencer has a long history of involvement with Habitat for Humanity at the regional level, including eight years of participation in its annual Corporate Challenge Program. Those who participated in this most recent Bergen County event were enthusiastic about the opportunity to gain first-hand experience with new tools and construction techniques during a day of challenging – yet very rewarding – work. To learn more about the Habitat for Humanity of Bergen County Sandy Restoration Program, visit https://www.habitatbergen.org/sandy-restoration-program. For more information on the bank’s community service initiatives.